Greetings friends and fellow crafters. Today I am participating in the Winter Coffee Lover's blog hop with Joy Clair and showcasing our new Coffee Lovers set. I have had fun with this and will be coming back with a couple more projects during this hop. 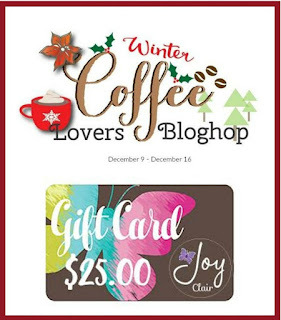 Come on over to the Joy Clair Blog and you can see how I made my card. A great gift card holder. Love the lacy edging you added to it too. 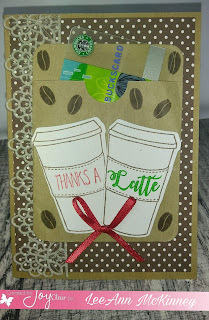 Such a fun gift card holder! Love this gift card holder that you created! It looks great with the coffee beans scattered around the background and I love the sentiments on the cups! love this card, love the colors and I am in love with this JC stamps set! Great way to give a giftcard! So pretty!